The mode of function of a shaker corresponds to that of a loudspeaker. The vibration movement is generated by the interaction of electric current passing through the plunger coil and a magnetic field. 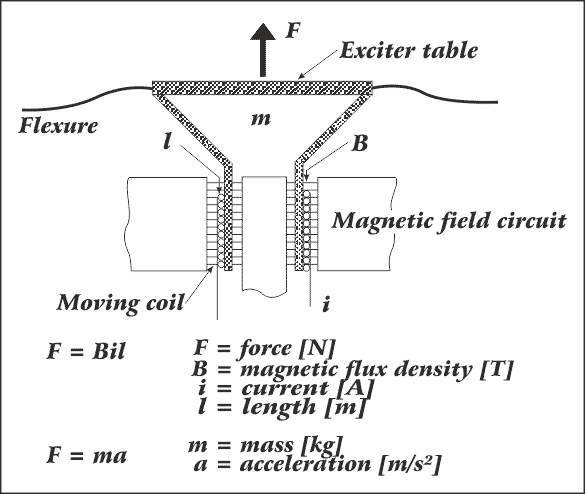 The force used to accelerate the moving element comprised of a ribbed body and the wrapped plunger coil is proportional to the coil current, the magnetic flux density, and the length of conductor in the magnetic field. The vibration level of shaker can therefore be controlled by electric current intensity. Graph 1 shows the sectional view of a shaker. In case of small shakers, the magnetic field is generated by means of permanent magnets and, in case of larger, base-mounted ones, by means of electromagnets. The maximum achievable acceleration is dependent on current intensity and total effective mass to be moved. At low frequencies, however, the limits of vibration velocity and displacement (travel) are reached earlier than those of acceleration. Graph 2 shows the acceleration as a function frequency in double-logarithmic (log-log) scale. The displacement limit is represented as a straight line with a slope of 12 dB/octave. A vibration velocity limit is often encountered on larger shakers, depending on the warm-up of springs and the maximum output voltage of power amplifier. This vibration velocity limit is represented as a straight line with a slope of 6 dB/octave. The upper frequency limit depends on the self-resonant frequency of moving element. A defined vibration amplitude of armature is required for vibration testing. The frequency response curve, however, is not flat but shows resonance peaks. Other resonances will be produced by the specimen. That is why the gain must be varied with the frequency run, comparing the actual vibration value of armature with specimen to a specified setpoint value. The vibration table control mainly consists of frequency generator, vibration meter and control amplifier (Graph 3). 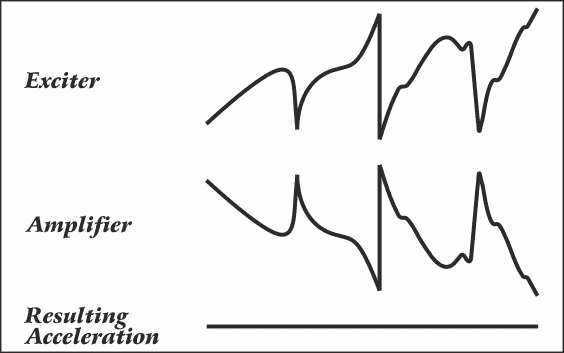 The frequency response curve of a shaker driven by a constant current can be broken down into three sections. The first two ones represent the spring-mass system of moving element and its suspension with a self-resonant frequency of 20 Hz. In the third section, axial resonances in the moving element will occur, thus defining the upper frequency limit of a shaker. This limit is typically over 3 kHz for large shakers. 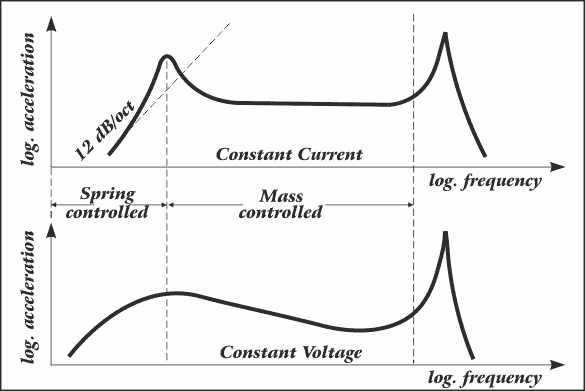 The frequency response curve for a shaker with constant voltage input can also be broken down into three sections. The lower self-resonant frequency, however, appears considerably damped, providing an easier control of vibration level. The constant driving voltage is generated by power amplifiers of low impedance output and normally preferred for almost all vibration tests. In the medium range, however, current control will partially be more advantageous, primarily in such cases where the shaker is used as force generator or run in non-feedback control mode. Unlike voltage control, this requires a high impedance output of amplifiers which will often have selectable impedance outputs (Graph 4).